Lymphoma is a cancer that begins in cells of the immune system. There are two basic categories of lymphomas. One kind is Hodgkin's lymphoma, which is marked by the presence of a type of cell called the Reed-Sternberg cell. The other category is non-Hodgkin's lymphomas, which includes a large, diverse group of cancers of immune system cells. Hodgkin's disease (HD) and non Hodgkin's lymphomas (NHL) - which together are called lymphomas - are types of cancer. Cancer is not one condition but a word applied to many different diseases, which have diverse causes and a wide range of treatments. The cells which make up our bodies normally divide in a set and orderly fashion so they can repair our tissues. This process sometimes goes wrong and there is an uncontrolled growth of cells. A characteristic of all cancers is this disorderly formation of body cells, causing swellings or tumours. A tumour is referred to as benign when it remains contained in a localised area of the body and, on removal by surgery, does not recur. The term cancer is used when the tumours are malignant i.e. they spread and invade healthy tissue. The lymphatic system is part of the body's natural defence against infection. It consists of a wide network of nodes or glands, which are found all around the body, and are linked by tiny vessels (or lymphatics). A clear fluid called lymph circulates around the body and is drained, via the lymphatics, into the bloodstream. Lymph contains white blood cells known as lymphocytes. They play a part in protecting the body from infection. As the lymph circulates through the lymphatics it is interrupted by the lymph nodes which provide the opportunity to sieve the lymph and attack invaders. When the natural division of cells in the tissues of the lymphatic system become disrupted, tumours called lymphomas occur. In common with other cancers, lymphomas are not infectious and cannot be passed on to other people. The causes of lymphomas are uncertain but, in some types of lymphoma, research points to a connection with particular viruses. There are about 8,000 new cases of lymphomas diagnosed in Britain each year. Less than a fifth are cases of Hodgkin's disease, the greater number being non Hodgkin's lymphomas. Hodgkin's disease was first identified by Dr Thomas Hodgkin in 1832. It is characterised by the large 'Reed-Sternberg' cells that may be seen under a microscope when a biopsy of an affected lymph node, or gland, is studied. The incidence of HD peaks in the 15 - 30 age group and more men are affected than women. Nowadays, Hodgkin's disease can be very successfully treated and many people are completely cured. As the improvement in treatment is relatively recent - since 1965 - some textbooks may be out-of-date and thus the information they contain can be misleading. There are many different types of non Hodgkin's lymphomas. Some are so mild that they require little or no treatment; some are very active. Broadly, NHL is divided into Low Grade (slow growing) or High Grade (the faster growing lymphomas). Some consultants refer to a third category, the Intermediate Grade, which is often considered similar to High Grade. Intermediate/High Grade NHL is an aggressive disease which always needs treatment but it can now be cured in a fair number of cases. With Low Grade NHL, although a cure is not usually possible, the disease can often be controlled for years and most patients can expect to lead a nearly normal life. Some rarer forms of lymphomas are hard to classify as they seem to have some characteristics of both HD and NHL. NHL is most common in people over 50 years old. It can also arise when the immune system has been suppressed because of other illnesses or conditions, including organ transplantation. On their own, each of these symptoms can be caused by less serious illnesses. You should consult your GP who will examine you and decide if further investigation is needed. A biopsy which is the removal of a small sample of tissue, such as an enlarged lymph node, for examination under a microscope. This is usually performed under a general anaesthetic, when you are sent to sleep for about half an hour or so. Blood samples will show the state of your general health and how, for example, your kidneys and liver are functioning. Chest x-rays will be taken to examine your lungs and the lymph glands in your chest. A bone marrow examination will show if tissue in this area is affected. The samples will normally be taken from your hip and the procedure, which takes only a few minutes, is carried out using a local anaesthetic and it may cause discomfort. Sedation may be offered, depending on the samples required. You will probably be asked to undergo a scan. This can be a CT scan (also known as CAT or body scan) or an MRI scan or an ultrasound scan of the abdomen. These scans are painless and take only about an hour, although preparation may be necessary in advance. Occasionally a lymphangiogram is used. This is a special X-ray of the lymphatic system, taken after a dye has been injected into your foot. The dye highlights the lymphatic channels and lymph glands. An overnight stay in hospital may be required for this test. A dye is also used for anintravenous urogram (sometimes called an IVU or IVP) but this time it is injected into a vein in your arm and passes through the bloodstream to show doctors, via an X-ray, any abnormalities in your kidneys or urinary system. This test takes place in the X-ray department and lasts about an hour. Such tests are necessary because many lymph nodes (or glands) in the body cannot be seen or felt, and other organs must be checked to see if they are affected. The assessment of what treatment is required will be based on these tests. You will probably have the results within 10 - 14 days. Staging is a system of assessing the spread of the lymphoma and is one of the factors considered in deciding your treatment. The stages refer to the parts of the body affected and also to 'significant symptoms' - namely, the amount of weight loss, fever and drenching night sweats. 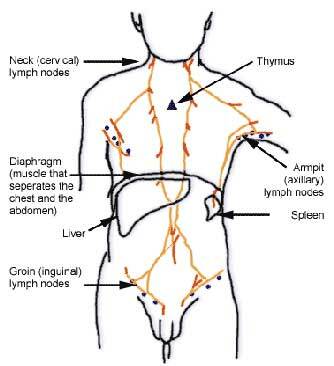 Stage 4: lymphoma has spread beyond the lymph nodes (or glands) to other organs such as liver, lungs, bone marrow etc. The lymphoma is classified as 'B' where significant symptoms are present and 'A' where there are no significant symptoms. Therefore, you may hear your doctor refer to your condition as Stage 1A or Stage 2B and so on. Even when a lymphoma is suspected, treatment will usually be delayed until all the tests and staging are complete. This may be frustrating for you, but a delay of a few weeks normally has no adverse effects medically and is far better than giving an inappropriate treatment too early. Your doctor will explain your treatment timetable. The length of treatment will depend on how well the disease responds to the drugs but will usually last for several months. The treatment of each person varies considerably. The results of your tests, the staging assessment, your age and general health are all taken into consideration. If the first course of treatment is not completely successful, there are other possible treatments. Hodgkin's disease is treated with radiotherapy or chemotherapy, or a combination of both. Intermediate/High Grade NHL is treated with chemotherapy or a combination of chemotherapy and radiotherapy. If it is localised it may be treated with radiotherapy alone or, occasionally surgery. Low Grade NHL may require no treatment initially. It may develop slowly and need only mild treatment with chemotherapy tablets which give few side effects. Sometimes, radiotherapy and/or intravenous chemotherapy are necessary. The object of treatment is to cure you, if this is possible. Where this is not, the aim is to keep the disease under control and minimise the side effects of treatment. Your quality of life is very important. However, you may need to accept that the treatment is sometimes unpleasant but essential in order for you to achieve a normal life in due course. It is important that you understand what your doctor is trying to do and that there is confidence between you. You should advise your specialist of any treatment you are having for other conditions, existing or new. Do not even have a minor operation or dental treatment without telling the doctor or dentist that you are undergoing treatment for a lymphoma. The care and treatment of children varies from that of adults and is usually undertaken in one of the specialist children's cancer units. These units have excellent information and support services for both young patients and their families. Radiotherapy uses powerful X-rays which are directed onto the cancerous cells to destroy them, while causing minimal damage to healthy tissue. Before treatment starts, you will be asked to meet the radiotherapists who will be supervising your treatment. The area to be treated will be measured precisely and outlined on your skin using a marker pen. The machines used to give radiotherapy vary but some are not dissimilar in appearance to X-ray machines. Treatment is usually daily, on weekdays, in an outpatient clinic and a course can last from between 2 - 6 weeks. Your radiographer will position you on a couch and will protect areas of your body which do not need treatment. The actual process is painless and lasts only a few minutes. You will be told how to look after the skin of the treated area and this is very important. Always ask if you are unsure about any aspect of your treatment. Chemotherapy means the use of one or more cytotoxic (anti-cancer) drugs which destroy malignant cells. Often a combination of four or more drugs is given, normally at intervals of between one and four weeks. The drugs are either injected or given via an intravenous infusion (drip) into a vein, so that they circulate in the bloodstream throughout the body. Certain drugs may be given as tablets. Another method is to fit you with a central line (for example a Portacath or Hickman line). This is a tube which is inserted, after anaesthetic, into a vein just above your collar bone. It tunnels beneath your skin and exits through your chest wall. It is used to administer your drugs and to collect your blood samples. The effectiveness of the treatment will be assessed throughout. In most instances, you should be able to have most of your treatment as an outpatient, but occasionally a night in hospital may be necessary. Some of the treatment regimens you may hear mentioned are; CHOP, LOPP, EVAP, Mini BEAM, BEAM, PACEBOM, Ch1Vpp, PABLOE (the initials refer to the combination of drugs). These are part of your treatment and have a direct effect on your tumour. They can also help to boost appetite and energy levels. The downside is that in the short term they may cause some sleepiness and, if taken over a long time, can give the face a moon-like appearance and cause weight-gain and sometimes insomnia. Discuss any problems with your doctor, both when taking steroids and afterwards. Steroids can make you irritable when you first take them and depressed for a few days on stopping. Short courses have very few side effects. Never stop taking steroids suddenly; your doctor will advise you on reducing them gradually. They are not the same as anabolic steroids which are banned in sport. Always carry a card stating that you are taking steroids, in case of emergencies. A small number of people may be treated with high dose chemotherapy. While 'blitzing' the cancer cells, this treatment severely suppresses the bone marrow where blood cells are formed, so patients are also given Autologous Bone Marrow Transplant (ABMT) or a Peripheral Blood Stem Cell Transplant (PBSCT). If you have an ABMT, bone marrow is drawn off under anaesthetic, and stored before chemotherapy starts. After the intensive treatment, the bone marrow is returned using an intravenous infusion or drip, rather like a blood transfusion. It will take your bone marrow some weeks to recover and resume its full role of fighting infection. For this reason you will have to stay in hospital for 3-6 weeks until your immune system begins to work again. With PBSCT, the procedure may start with a 'priming' dose of chemotherapy plus a growth factor drug to mobilize the production of stem cells, the primitive cells from which most blood cells develop. Blood will be taken from you using a machine called a cell separator. This collects the stem cells, and returns the rest of your blood to you. This does not involve anaesthetic but does take 3-4 hours. The collected stem cells are then stored while the main treatment takes place, and returned via a drip to help the bone marrow recover. Your recovery time afterwards should, generally, be shorter than for an ABMT. Occasionally the disease does not respond to the first treatment used or recurs afterwards. There will be a number of options. Another treatment will be devised, taking into account the response to the first, for example, if radiotherapy was used alone, chemotherapy may be a good second treatment. A different combination of drugs may be required if chemotherapy has not been successful the first time, or intensive treatment may be considered. Throughout your treatment and during the period immediately afterwards, you will be very susceptible to infection. If your spleen has been removed, you are especially vulnerable to certain infections and should see your doctor immediately at the first sign of illness. Most infections arise from bacteria in your body and cannot be avoided, so tell your specialist if you develop a sore throat, fevers, unexplained sweats or shivers. Avoid people with infectious diseases, particularly chickenpox or measles. Your doctor will be able to tell you if you are likely to have any side effects from your chemotherapy or radiotherapy. Such side effects are usually temporary and there are ways of mitigating them. Chemotherapy drugs affect not only lymphoma cells but also normal cells, especially the ones which multiply fast such as those in your intestine, hair and bone marrow. The following table lists the common side effects and suggests some ways in which they can be minimised.